Not to be confused with the Mtsvane from Kakheti, this ‘Green from Gori’ has a variety of alternative names and synonyms. Commercially, however, it is labelled consistently as Goruli Mtsvane. The Variety is mostly planted in the alluvial soils along the river Mtkvari including the Aten Valley. Thick-skinned, the berry is yellow-green and medium-sized. The bunches are cone-shaped and winged. Goruli Mtsvane is relatively resistant to downy mildew with average frost resistance. One of Georgia’s lighter-bodied wines, Goruli Mtsvane is the best drunk when young and fresh, when its floral, lime, and subtle honeyed notes are crisp and most vibrant. Goruli Mtsvane is also blended with Chinuri and Budeshuri Tetri for sparkling wines, most notably th PDO Atenuri. Goruli Mtsvane, fermented with the white Chinuri and red Tavkveri in Qvevri, produces the classic red Khidistauri (i.e. from the town of Khidistavi near Gori). 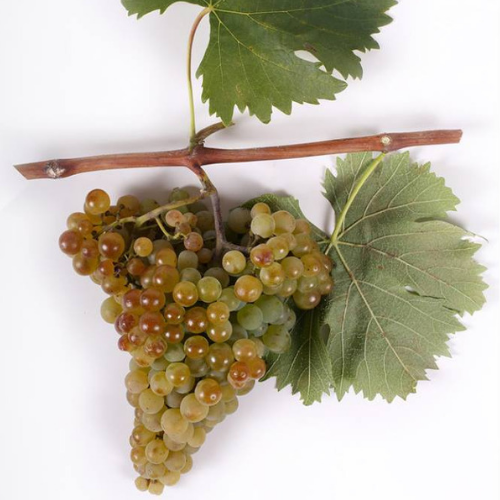 Goruli Mtsvane may also be blended with Chinuri alone for sparkling wines.